Description: From their only home atop a 1985 production Iver Johnson .22 caliber rifle comes this distinctive set of Weaver See through mounts that fit a rimfire rifle with a 3/8 inch dovetail width grooved receiver. Manufacturer was W.R. Weaver Company of El Paso. Construction is blue steel ring tops with 4 screws apiece, and black anodized lower piece mounts with two steel screws in each. These mounts are designed to secure a 1 inch tube diameter scope onto a rifle that has a 3/8 inch wide dovetailed groove on top of its receiver, or on a Ruger 10/22 that comes with its factory 3/8 inch adapter. 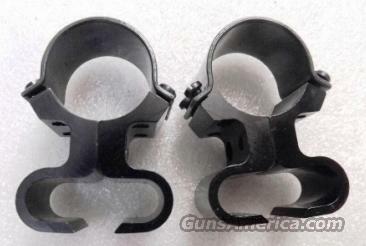 These mounts, of course, enable the shooter to use both his or her iron sights as well as a scope, so long as the scope lenses do not exceed 40mm diameter. Models included are Mossberg Plinker 720 series, Marlin model 60, Remington 552 series rifles, and the venerable Nylon series Remingtons. These mounts will not fit a Weaver or Picatinny Base; they will not fit Ruger 77/22 Rifles; and they will not fit on the rear view mirror of a 1959 Edsel Sedan. They will only fit rifles that have 3/8 inch dovetailed rails on top of their receivers like the ones we mentioned above. This type mount is readily available by other manufacturers, but not from the original El Paso Weaver Company with 4 screw steel tops like these. For collector purposes, these mounts are period correct for any rifle manufactured in the 1970s or 1980s. We’re offering them	for only	$ 49.00.